Are you a Duck fan? You will be when you meet me! My name is Duck, but I’m no quack. 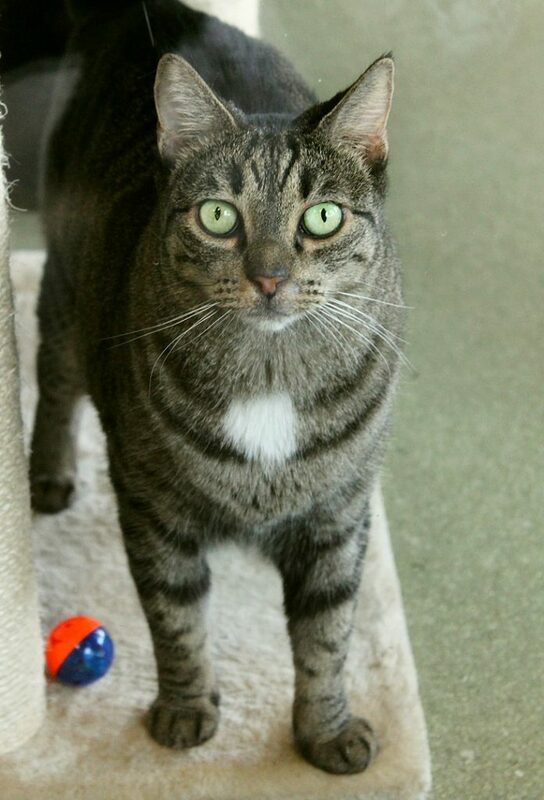 I’m a silly and sweet chubby 6-year-old lady cat that would love to be a part of your family! I came from a family with young children and I am extremely tolerant of handling as well as other cats. I seem very interested and friendly towards dogs as well — I’m friendly towards just about anyone I meet! I am currently residing in the Pixie cattery and am generally the first to come up and greet anyone who walks in the door. If you start petting me and then have to pause, I will give you a cute little “mew” and ask for more! Although I’m a smidge overweight, I’m in excellent health and am an overall very low-maintenance kitty. I do think I’d be happiest in a busy household with lots of activity and attention — I don’t have much of an independent side! Are you looking for a fabulous furry family member to help you cheer on the squad? I’m ready to be part of your team! I come to you fixed, vaccinated, and micro-chipped for an adoption fee of $100.